Neither Ambedkar nor Patel was in favour of a strictly parliamentary system. As we celebrate the day when our Constitution came into effect, many misconceptions about how the Constituent Assembly chose the parliamentary system for India remain. Most Indians believe the parliamentary form of government was the unanimous choice of the Constituent Assembly, but facts prove otherwise: our founding leaders Jawaharlal Nehru, B.R. Ambedkar and Sardar Vallabhbhai Patel were not on the same page. At the time, neither Ambedkar nor Patel was in favour of a strictly parliamentary system. For that matter, neither was Mahatma Gandhi nor Pakistan’s founder and All India Muslim League leader Muhammad Ali Jinnah, although they were not involved in the framing of our Constitution. There were two points of disagreement: whether India should be a unitary or federal state and whether the head of government should be elected directly by the people or indirectly by the legislature. But the matter was far from settled. Nehru’s committee continued to develop the Union Constitution along the old lines, while Patel proceeded to devise a Provincial Constitution with directly elected governors. A few days later, another joint meeting had to be called. Held on 10-11 June 1947, this meeting was chaired by Rajendra Prasad and attended by 36 luminaries, including Nehru, Patel, Ambedkar, K.M. Munshi, Syama Prasad Mookerjee, Govind Ballabh Pant, Jagjivan Ram, A.K. Ayyar, K.M. Panikkar and J.B. Kriplani. The Draft Constitution was modified to have governors appointed instead of directly electing them. This was the only reversal of a major constitutional principle in the Assembly’s history. It had many similarities with the US-style presidential system. When Ambedkar’s proposal came up for discussion, he chose not to attend the session. By then he had become the chief proponent of the Congress’s decision to have a parliamentary system. 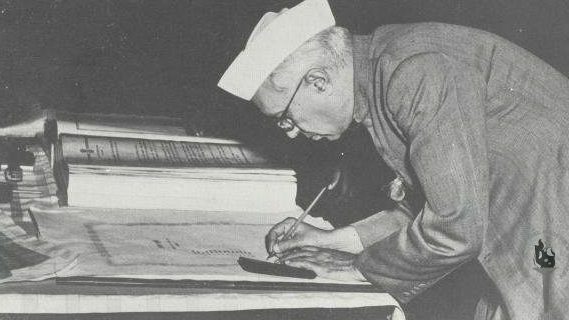 When in July 1947, Nehru took his Union Constitution proposals to the Assembly, members were well primed to take a party line decision. The Congresspersons were not allowed to vote freely. In a practice unheard of in a constitution-making body, India’s Constituent Assembly functioned under a system of whips issued by the party high command. It is astonishing that India’s Constituent Assembly never voted on the question of whether the country should adopt the parliamentary or another form of government. The members were merely given the choice to approve the recommendations of the committees. No alternatives were presented and there were no opportunities given for reconsideration. When, near the end, Ambedkar commended the parliamentary system—including his famous point that it offers more responsible albeit less stable governments than the presidential system—the decision to adopt had already been made. He was merely justifying the Draft Constitution, which everyone knew had the sanction of the Congress party. It is high time India reconsidered the choice of the parliamentary system. The parliamentary system is well suited for India which has diversity though there could be some hiccups in the beginning. But during the last seven decades the system has passed the test and now there is no need to go for any other system. In the assembly there is bound to be difference on opinion among members. That does not mean the final resolution could be reversed with the passage of time. Our judicial system has corrected many working flaws in the constitution. Hence it be safe for the country to maintain the present constitution. Seven decades of experience has shown that the current system is well accepted by the people and no calamity has been visited on the nation by adopting this system. The genius of the Indian people – who are argumentative and yet seek consensual outcomes – is best expressed through the parliamentary system with an executive answerable to parliament.